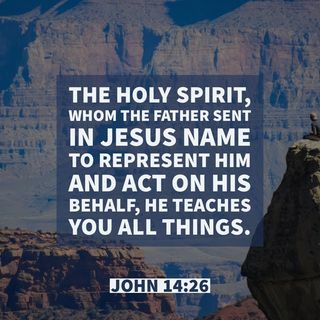 How You Can Depend On the Holy Spirit to Help and Direct you in All Your Ways. God created you to depend on Him, to Live in reliance upon and dependence on His Holy Spirit and to Guide you in the direction you should go in ALL the affairs of life. Trying to live in this world in your own strength is forgetting, that you live in the world's where the unforeseen forces of darkness, the principalities and powers mights and dominion are working against you. For your wrestle is not against flesh and blood, but the enemy distracts you, and even blinds you to their work around. So how do you live a life in a world where the invisible is more powerful than the visible? So, Put on God's whole armor, the armor which God supplies through His Spirit Living within you, that you may be able successfully to stand up against [all] the strategies and the deceits of the devil. The Holy Spirit Himself Divinely Persuades You, He Testifies together with your own spirit, directing and assuring you as a child of God. Walk and live habitually in the Holy Spirit, responsive to and controlled and guided by the Spirit; then you will certainly not gratify the cravings and desires of the flesh of human nature without God. To walk in the Spirit is to make the Spirit of God the rule your behavior, action, attitudes, and motives, which requires Him Divinely Persuading in All the Affairs of Life. The Holy Spirit is your Helper, He Who Lights your path, Who Guides you in all truth, and you depend upon His Grace and Strength for Assistance throughout the Whole of Your Walk in Conversation, Relying on the Exercise of His Grace and the Love of God, to Produce His Fruits and Gifts in You Need for Every Situation and Circumstance of Life.